Labour must remain in “permanent campaign mode” and prepare for a fresh general election at any time, Jeremy Corbyn has told his MPs. The Labour leader said he would continue to campaign in marginal seats across the UK while opposing Theresa May’s government in Westminster. Urging MPs to maintain “unity and collective discipline”, he said Labour must act as a “government in waiting”. Labour gained 30 seats and won 40% of the vote for the first time since 2001. Nevertheless, the party still ended up with 56 fewer seats than the Conservatives, who are seeking to form a minority government with the Democratic Unionists. New research from YouGov suggests voters under the age of 40 backed Labour by a decisive margin, and that the party also outperformed the Conservatives among the 40-49 age bracket. But according to its survey – which suggests that the British electorate is now divided more by age than class – Mr Corbyn struggled to win support among the over 60s. Did Corbyn have youth on his side? Addressing the Parliamentary Labour Party for the first time since he defied expectations in the election, Mr Corbyn instructed MPs to remain on a general election footing. “We must remain in permanent campaign mode,” he said. “We achieved what we did last Thursday because we were a united party during the campaign and we need to maintain that unity and collective discipline in the weeks and months ahead. Theresa May has no mandate to govern, he suggested, and her administration is “on notice from voters”. Mr Corbyn is expected to reshuffle his shadow cabinet in the coming days with several senior figures who called for him to step down last year after the EU referendum hinting they are open to a return. 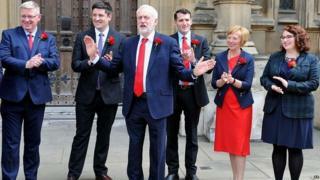 Earlier on Tuesday, the Labour leader got a standing ovation from his MPs as he took his seat in the Commons for the first time after the election.